Leicestershire Police is giving members of the public the chance to buy a £95,000 dream car. 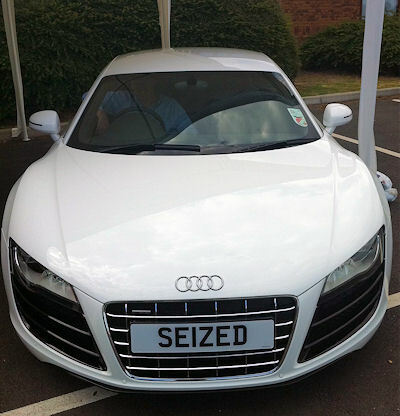 The Audi R8 two-seater sports car was seized by the Force as part of a money laundering investigation. The car subsequently formed part of a Confiscation Order granted at Leicester Crown Court in June this year. Today (Friday, September 7) it is on public sale on Leicestershire Police’s eBay shop. The Force hopes the story will prompt members of the public to pass on information about others who could be living lavish lifestyles through criminal means. “We, working together with our partner agencies, will ensure that criminals do not profit from their crimes. “We will use all of our criminal and civil powers to strip offenders of their ill gotten gains. “Following a court order being granted the goods we have seized are sold with the proceeds going back into the public purse. This money is used to fund the fight against financial crime. The car listed on eBay and on display today (Friday 7th September) was seized from a Leicestershire man, who could not explain how over £130,000 in cash had passed through his bank accounts. He pleaded guilty at court to an offence under the Proceeds of Crime Act. “Investigations like this are often sparked by a call from a suspicious neighbour or work colleague. If somebody you know appears to be living an extravagant lifestyle which is beyond their means, then we would like to hear from you. “It could be that they are involved in burglary, theft, fraud or drug dealing. Your call could assist in putting them before the courts and ensuring they are deprived of their criminal assets. Leicestershire Police works closely with both the Crown Prosecution Service (CPS) and Her Majesty’s Courts and Tribunals Service (HMCTS) to ensure criminals do not profit from their crimes. “The law allows us to ensure that criminals do not profit from their crimes. Legislation under the Proceeds of Crime Act (POCA) enables us to prove in court how much an offender has amassed from their criminal activities, and secure orders for this to be recovered from the offender. This can vary from small amounts from petty thieves to hundreds of thousands from major drug dealers and fraudsters.